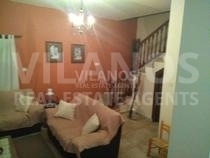 Code No.10578 For rent furnished House, independent 3 bedrooms in Pachna village in Limassol. Covered area 135 square meters, 2 levels. Featuring 3 bedrooms, living room, kitchen open plan, 2 WC , 1 quest and 1 main with bathroom, 1 covered veranda, 1 covered parking and 1 storage room. It’s also fully furnished with fitted appliances, fridge, dish washer, a/c, light features, roller blinds and water pressure system. The house is located North of the centre of the town in one of the nicest and quiet area, close to it have all amenities and near that area you can also find a park. It has easy access to the motorway, and it’s located about 30 km or 30 minutes from the roundabout of Polemidia It is perfect for those who are looking for a home that offers convenience and a contemporary way of life.